I feel sorry for Oregon State. No, really. 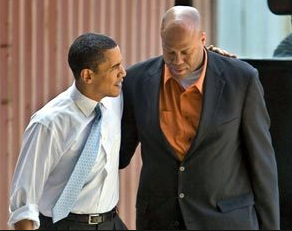 They have just put themselves on the radar screen for an IRS audit by ousting Craig Robinson, Barack Obama’s wife’s brother who has just been fired as basketball coach. Robinson was 93-104 in six years at Oregon State with no NCAA tournament appearances. The Beavers were 16-16 last season and will lose all five starters. Robinson had three more years remaining on this contract and the university is expected to owe him more than $4 million. In short, OSU Athletic Director, Bob DeCarolis, decided the angsty fans and boosters had more juice than Craig Robinson’s brother in law. Now that’s saying something considering President Obama has drones, the NSA and IRS doing his bidding. Sure, it was great that Robinson could sometimes get the country’s highest profile hoopster, Barack Obama, on the sidelines for some games. He could even wrangle an oval office visit for Beavers players. The problem was Craig Robinson’s team didn’t actually earn the trip to the White House. Those trips are usually reserved for winning teams. I remember being the first to get the broadcast interview with Robinson upon his hire in Corvallis. I worked at the then Beavers flagship station and asked the usual basketball questions but I also thought I’d make the interview topical for my mostly politically inclined audience. I asked Robinson about his brother in law’s church which had been in the news. Robinson lectured me on how truth was spoken at the most wrong Rev Wright’s church. Whoops. Then I asked the University of Chicago MBA about the one time conscience of his business school, Milton Friedman, and whether he had ever talked to his famous in law about fiscal conservatism. Robinson icily responded that he had not. I was mocked in the sports media. I was never again invited to host or attend any Beavers sporting event. And now so has Craig Robinson.